There are just so many things that you can experience and enjoy while you are visiting the beautiful and historic village of Sandsend near Whitby. The Yorkshire Coastline is delightful. The northern boundary is industrial Teesside with the coastline stretching down to the equally built up Kingston upon Hull. In between, the settlements are of various sizes with many small villages great places for anything from a day trip to a delightful holiday. One such village is Sandsend just a short distance from the historic small town of Whitby. North Yorkshire Moors come down to the Coast and add to the beauty and attractiveness of the whole region. The origins of Sandsend date back to the development of the alum industry. There was a railway line linking Whitby to Teesside; the railway station opened in 1883 and closed in 1958, a few years before Dr. Beecham began stringent cuts on the whole national rail network. Many years ago, Sandsend and East Row were separate villages that were later joined after additional cottages were created for the workers within the alum industry. The village was also supported primarily by tourism that is drawn to the Whitby, Redcar and Middlesbrough Union Railway year after year. Sandsend railway station was the local station that was opened in 1883 and closed almost 100 years later in 1958. “Sandsend is a delightful village that looks as if it came straight out of the pages of an illustrated storybook”. There is a wide variety of fisherman’s cottages spread throughout the village that face the extensive sandy beach and are set up against a series of grassy cliffs that captivate your attention as well. Even though Sandsend is a fairly small village, there are so many different things that you can do and places that you can see while you are there – including a Post Office, pub, church and tennis courts for physical recreation. One of the most popular places to go and experience for yourself while you are in Sandsend is the beach. If you are interested in having a great family outing, regardless of the time of day, then you can head down to the beach. If you are looking for a romantic way to spend some time with the person that shares a special place in your heart, then you will definitely enjoy a moonlit walk along the shore. By day, it is the beach that is really appealing. When the tide goes out, the kids will love exploring the rock pools for signs of life. Be careful of the crabs’ claws because you’ll certainly find some as well as small fish and shrimps. Even at sunset and beyond, Sandsend beach is a lovely place for a stroll. The North Sea may not be as warm as the Med. but it is certainly refreshing on a warm day. When there is a breeze you might like to try your hand at surfing while if the tide is in, sea angling may well bring you some rewards. There is an abundance of rock pools at the bottom of the cliffs that you can explore after the tide recedes. People of all ages seem to enjoy being able to experience that as well as exploring the small fish, shrimps, crabs and other aspects of marine life that inhabit that area as well. You can also search for fossils as Sandsend. Fossils are regularly found at Sandsend beach and it is fun to guess what each fossil was as a living being. Sandsend beach and the surrounding area has been a regular haunt for archaeologists and palaeontologists from different parts of the world because of not only the fossils but also historical artefacts that have been found over the years. Even though you can have an enjoyable time exploring the beautiful waters from the shoreline, there are so many different activities that you can become involved with while you are in Sandsend that allow you to enjoy the water firsthand. If you are interested in taking a relaxing swim or even surfing the rippling waves or sea-angling along the high tides, then you definitely want to make sure that visiting Sandsend is towards the top of your destination list. Nature has reclaimed an area which once experienced significant industrial activity; the abandoned alum quarries remain interesting. Walkers and hikers can combine their love of exercise and fresh air with a little exploration. ‘’The Sandsend Trail’’ is just one of the possibilities. Mulgrave Castle in Lythe is a place to check and is part of ‘’The Geocache Arts Trail’’ which is explained in a booklet available in local stores. The Castle was built by the Normans after William the Conqueror’s invasion. The Castle has a rich history though it was often neglected at times when it was not seen as having any strategic importance. The Castle has been ruins for some time and is located in a lovely valley; it is a private estate but visitors can get entry to this lovely wooded estate on Wednesdays and weekends in all but the month of May. “Mulgrave Estate has been the home of the Marquis and Marchioness of Normanby since the middle of the 18th Century”. St. Oswald’s Church in Lythe has some extremely interesting Anglo-Scandinavian stones and while you are there you will have great views of both Sandsend and Whitby. The third trail associated with Sandsend is ‘’The Cleveland Way National Trail’’ with the walks close by to either Whitby or Runswick Bay. Sandsend is also known for being the land of historical findings, such as prehistoric fossils and other ancient artefacts. Archaeologists and palaeontologists from all over the world scope through this area on a regular basis throughout the year as part of their jobs, but you never know what you might find with a sharp eye and a little patience while you are enjoying your pleasurable vacation. Some of the top areas that you should check out are the 12th century Mulgrave Castle that is in Lythe as well as the old alum quarries that were the historical areas where highly valued alum shale were mined many years ago. There are just so many things that you can experience and enjoy while you are visiting the beautiful and historic village of Sandsend nr Whitby. You can enjoy a wonderful day or even a romantic night at the beach. You can explore the waters firsthand through swimming, sailing, sea-angling or even snorkeling to explore the marine life. If you are interested in learning a lot while you are there, you can enjoy the variety of historical sights and tourism spots that are spread throughout the village as well. 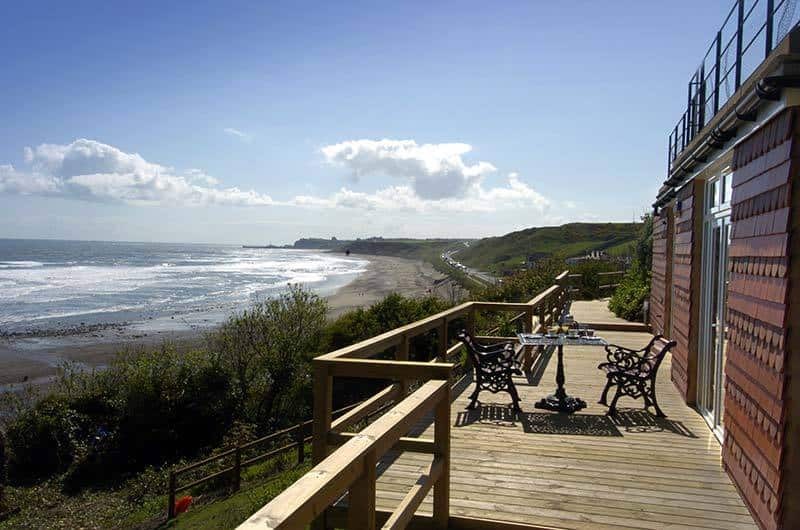 The Hart Inn is the local pub and the little cafes are a great place to relax with refreshments at Sandsend beach. In addition, there are two good quality restaurants that are definitely worth a try if you are in self-catering accommodation with the intention of eating out at night. The Bridge Cottage Bistro is within the Mulgrave Estate where you can choose between eating indoors our out. Etsbek House is another great restaurant and both these establishments use locally produced ingredients where available, especially fish. While some of the quaint cottages were employed in the alum industry, others were homes to local fishermen. The cottages sit beneath cliffs with great views out to the lovely sands and the sea beyond. Sandsend Bay Cottages has 8 fabulous cottages with accommodation for up to 6 people in one case; none are too far from the beach. They are converted barns fitted out to the highest specification with a rating of 4 stars. The owners live on site and are proud of their ‘’Enjoy England Gold Star’’ from the Tourist Board. They are no smoking, and sorry, no pets, but are disabled friendly with ample parking, include a children’s play area, fully heated and have hot tubs and Wi-Fi as standard. This small, comfortable hotel is close to Sandsend’s lovely beach. It is suitable both for a romantic weekend for couples and a family holiday in self-catering accommodation, The School House. The Woodlands has 5 rooms, all en-suite with king-sized beds. One of the five is ideal for a family because of the additional twin beds. The School House is a 3-bedroom property ideal for up to 6 people. Two of the bedrooms have king-sized beds while the third is twin-bedded. There is ample parking, Sky TV and Wi-Fi and 2 bathrooms in this newly-refurbished accommodation. There is a public bar with guests able to enjoy breakfast and dinner in the restaurant. It Is open at 7pm from Wednesday to Sunday inclusive with a seasonal menu and locally produced ingredients. Mulgrave Cottage Guest House Sandsend is a nineteenth-century grade II listed building set in its own secluded wooded grounds just moments from the beach at Sandsend. Mulgrave Cottage B&B in Sandsend has recently been renovated; this delightful period building has been modernised to a very high standard to provide the best in luxury bed and breakfast in Sandsend. There are 6 cottages on the Estate available for holiday rental. Each has parking, Wi-Fi, private garden and pets are welcome by prior arrangement. Cots and high chairs are available on prior request. One of the cottages sleeps up to 8 people and a second 6, both being a refurbished amalgamation of smaller estate cottages. Three further cottages are 2 bedroom, double and twin while the 6th is for a couple.